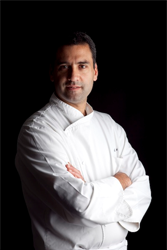 Aharon Politi’s culinary journey began in 2002 when he commenced his culinary studies at Le Cordon Bleu. Since graduating with a Cuisine Diploma, Ahron has successfully made a name for himself in the world of cuisine, having set up his own catering company, amongst other achievements. Aharon Politi was born in Haïfa, Israel. After travelling extensively, it was in New York, while studying to become a software engineer, that he discovered his passion for cuisine. “Gastronomic cuisine still has a limited public in Israel, so obviously, becoming a Chef is not a childhood dream. It is a vocation that is discovered, revealing a new love,” he explains with feeling. “And the advantage of a late blooming love is that one has the maturity necessary to seek excellence and to focus on the essential.” For Aharon Politi, it was inevitably Paris and in particular Le Cordon Bleu that he had to attend. Starting again from zero, learning French was not a problem for this cosmopolitan polyglot. “Many of the students at Le Cordon Bleu were, like me, from other countries. To be in a multicultural environment, while learning traditional French gastronomy was extremely enriching!” Having graduated, a whole new world opened up to him and he had the opportunity to work with some of the greatest Chefs in prestigious restaurants such as Lasserre, Taillevent, and La Grande Cascade. The rigor required to produce the desired results, the highly prized savoir-faire, the perfection of each movement, the near military discipline required of the team, are all values which are of upmost importance to this former Army Lieutenant. His experience of working as sous-chef at the Grand Véfour for Guy Martin taught him that gastronomic cuisine can be found in a laboratory, on a Parisian bistro menu, or even in a household kitchen. Today, Aharon Politi is director of YNRA consulting, a culinary consultant for numerous establishments. He leads workshops and demonstrations for Bishulim School, Academy of Higher Studies in the Culinary Arts in Israel. He has also set up his own gastronomic catering company, Le Traiteur, which allows him to follow his passion and where the only limit is his own imagination.